Attractive piece and historical slice of Denmark! Erected by King Gorm the Old - 954 A.C. & King Harald Bluetooth - 964 A.C. The Jelling Stones is a National Monument and "The Birth Certificate of the Danish Kingdom". The Jelling Stones are erected beside Jelling Church situated in the small town of Jelling on the eastern part of Jutland and near Vejle Fjord. King Harald Bluetooth made the Danes Christian in 964 A.C. - according to the big Jelling Stone. 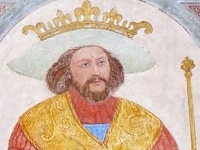 This portray of the King can be seen in Roskilde Cathedral. When visiting Jelling and the two Runic Stones placed beside Jelling Church from 1050 A.C. - and the two Royal Burial Mounds of the first monarchs of Denmark - King Gorm the Old and Queen Thyra Danebod - then one is right in the centre of more than thousand years of Danish history. The big Jelling Stone - was erected by King Harald Bluetooth in 964 A.C. - to honour his parents King Gorm the Old and Queen Thyra Danebod - and is a National Monument together with the little runic stone raised by King Gorm in remembrance of his wife Queen Thyra Danebod in 954. The biggest runic stone is called “The Birth Certificate of Denmark” - and the two runic stones at Jelling - as well as the to royal burial mounds symbolizes the foundation of the Danish nation - and the first sign that the Danes being converted to Christianity around year 964 A.C.. 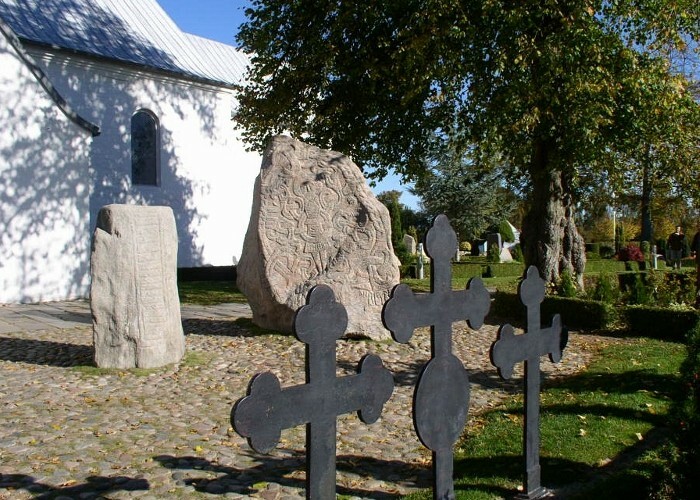 The two Jelling stones are placed in the churchyard of Jelling Church between the two large entombment mounds called the northern hill and southern hill - where King Gorm the Old and his Queen Thyra Danebod was buried in the past. "King Haraldr ordered this monument made in memory of Gormr - his father, and in memory of Thyrvé - his mother; that Haraldr who won for himself all of Denmark and Norway and made the Danes Christian". DENMARK AS A CHRISTIAN NATION SINCE 964 A.C.
"The Birth Certificate of the Danish Kingdom". 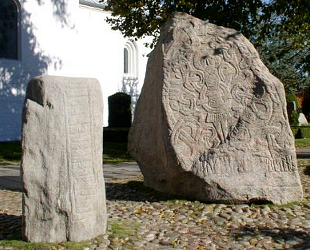 The Runic Stones at Jelling placed beside of Jelling Church are considered as "The Birth Certificate of the Danish Kingdom". King Gorm's little runic stone in memory of his wife Queen Thyra Danebod - and King Harald's sepulchral monument over his parents King Gorm the Old and Queen Thyra. 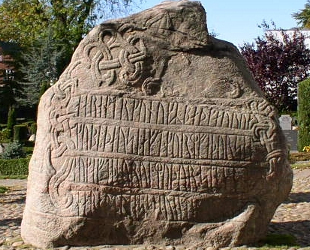 King Harald Bluetooth erected the big Jelling Stone and Royal Monument around 958 - as a memento of his parents King Gorm and Queen Thyra - but the stone also in the inscription praises himself for making all Danes Christian "that Haraldr who won for himself all of Denmark and Norway and made the Danes Christian". The inscription on King Gorm's little Jelling stone from 954 - mentions the name "Denmark" as a country for the first time in Danish history - and is the very start of the Danes Cultural Heritage and National Identity - that is the cornerstone of the Danish Nation - which has followed the Danes up to date. When Queen Thyra Danebod dies around 954 - King Gorm raised a little runic stone to commemorate his wife with the inscription "King Gormr made this monument in memory of Thyrvé, his wife - Denmark's adornment." (Gorm konge gjorde kumler disse efter Thyra kone sin Danmarks bod). When King Gorm dies around 958 A.C. - his son King Harald Bluetooth erected the big Jelling Stone and Royal Monument in 964 A.C.
How the environment of Jelling probably looked like in the 10th century - when it was the capital of Denmark. The Royal Danish dynasty - started in Jelling and became the strongest power in Northern Europe. 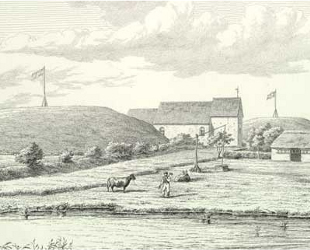 Jelling Church portrayed in the 16th century with the two Royal Mounds on each side of the church. 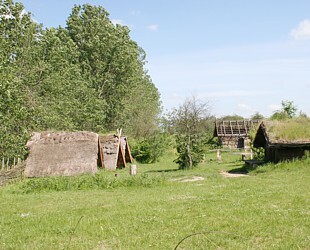 In the 10th century and for more than 1000 yeas ago - the little Viking village called Jelling on the east coat of Jutland was a quite important part of Danish history. The Jelling Settlement was the official capital of Denmark and the centre of all political power. At that time the later Vejle Fjord went right up to Jelling - where ship could enter the city by sea and where trading activities flourished together with an increasing numbers of citizens and Viking Worriers. King Harald Bluetooth decided to shift the two Norse Gods Odin and Thor with Christ and the Christian religion and faith - which made all the Danes Christian and Christianity the most influential religion in Denmark from year 964. 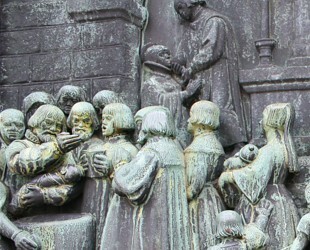 This marks the start of changes for the Danes belonging to a new religion - and after the Protestant Reformation in 1536 - which was related to other western and European Christian civilizations - Christianity has been a great bonus for the Danes and Danish nation in modern time. Queen Thyra Danebod was the mastermind of expanding the great earthwork fortification called “Danevirke” - which was built around 800 by A.C. by Viking King Gudfred - as a defence system to protect the Danes from southern German invasion. The “Danevirke” earthwork fortification is 30 km long and just a row of hills with some brick walls in the northern part of Germany that can be visited today. 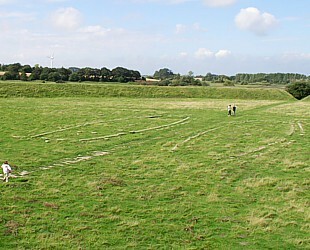 The remains of the "Danevirke" walls stretch from the east coast to mid marshlands of the Jutland peninsula. In Jelling - the Danish King Gorm the Old (Gorm den Gamle) born in 890 - once resided and reigned Denmark up to his death in 958 A.C. King Gorm was also King of Norway and the northern part of Germany called Holsten. Gorm was son of King Hardeknud from Norway. King Gorm was married to Thyra Danebod - who became Queen after their wedding and died later in 954. Their son Harald Bluetooth (940-986) King of Denmark and Norway from 958 to 986 - resided in Jelling too - which was the base for his many crusades with his army to other Nordic countries. King Harald Bluetooth was married to Queen Tove of Denmark - who was from Venden. In Jelling King Gorm the Old founded the royal Danish dynasty - which has a straight monarchical line to our currently reigning monarch - who has ancestral links stretching back over 1,000 years. The Period of Viking Ring Forts and "Danevirke"
Jelling was specially the powerful centre for King Harald Bluetooth - and he was the architect and entrepreneur for building all the Viking Ring Fortresses in five strategic locations in Denmark. 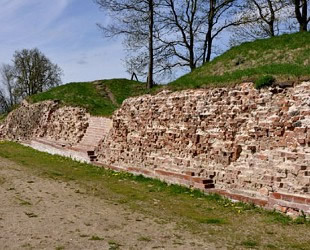 His mother Queen Thyra Danebod extended the Danish fortifications system in Schleswig-Holstein (Northern Germany) - as she was the mastermind of completing and strengthen the great earthwork fortification called “Danevirke” - Danavirki - Danæwirchi - Danewerk or Danernes Værk - "The Danes Work" - built by Viking King Gudfred around 800 A.C. - which was a defence system to protect the Danes from southern German invasion - and became a powerful national symbol for Denmark during 1800s and 1900s - uniting the Danish people and strengthening their Danish Cultural Heritage. King Gorm the Old and Queen Thyra Dannebod - who were the first monarchs of Denmark and founder of the royal Danish dynasty that has a monarchical line straight to our currently reigning monarch. 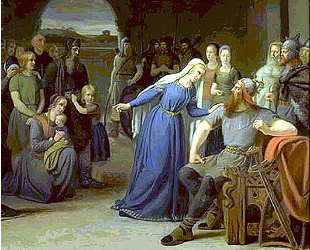 King Gorm the Old and Queen Thyra Dannebod - are the first Danish Monarchs. Trelleborg Viking Ring Fortress - 980 A.C. The Trelleborg Viking Ring Fortress from 980 A.C. on Sealand - was built by King Harald Bluetooth together with four other Viking ring forts that were placed in five strategic locations around in Denmark. 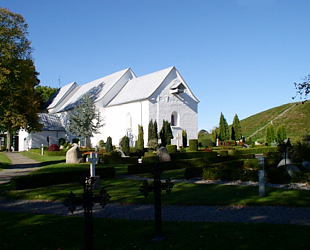 The first Jelling church was of wood and probably build by King Harald Bluetooth - and the present Jelling Church is from 1050 and one of the oldest churches in Denmark. In 2000 the bones of King Gorm the Old was laid to rest under the church floor of the Jelling Church. The remains of King Gorm were found during the restoration of the chamber grave in 1978. The two huge burial mounds that is placed on each side of Jelling Church is most likely the final resting plot of King Gorm and Queen Thyra. Both mounds were empty and just found with a few artifacts - when they were opened. The theory is that both mounds represent an old Viking burial tradition - whiles it’s possible that both King Gorm and Queen Thyra have been moved from the mounds and buried under the old wooden Jelling church after a Christian ceremony. Jelling Church built around year 1050 A.C. - where King "Gorm the Old" and his Queen "Thyra's" mound's are placed on each side of the church. The two royal burial mounds are the largest in Denmark - about 8.5 meters high and 65 meters wide. King Gorm the Old was buried under floor of Jelling Church in 2000. The interior of Jelling Church where the remains of King Gorm the Old was buried under floor of the church in 2000. 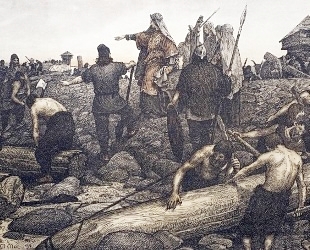 The skeleton of King Gorm was found in the first wooden church at Jelling - after his son King Harald Bluetooth had removed it from one of the mounds. 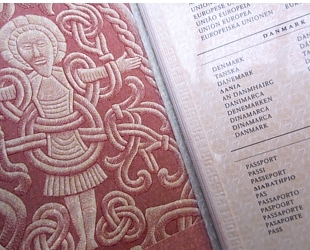 In the maroon Danish passport there is an image of the engraved figure of Christ from the biggest Jelling Stone - and was selected to indicate the Danes Christian upbringing - their national identity - historical background and cultural heritage - and most of all that the complicated pattern of the runic ornament was difficult to copy and prevent forgery. The Runic Stones are the Danes National Symbols that relates to their Christian Identity. In all Danish passports there is an image of the Christ figure derived from the biggest Jelling Stone - symbolizing the Danes Christian upbringing and culture. The maroon passport is a powerful Document that gives access to over 170 countries worldwide - without applying for a Visa. The Runic Stones and the area around Jelling Church - plus the two Mounds of King Gorm and his wife Queen Thyra of Denmark was selected as an World Heritage Site by UNESCO in 1994 - which in brief describes the Christianization of the Danes towards the 10th century. 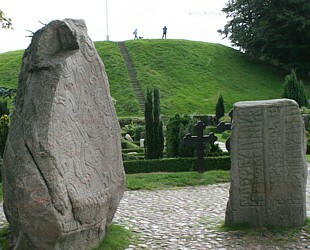 The Jelling Runic Stones and surrounding royal burial mounds of King Gorm and his wife Queen Thyra of Denmark was selected by UNESCO as a World Heritage Site in 1994 . The brief description from the World Heritage list states that - The Jelling burial mounds and one of the runic stones are striking examples of pagan Nordic culture - while the big runic stone and the church illustrate the Christianization of the Danish people towards the middle of the 10th century. 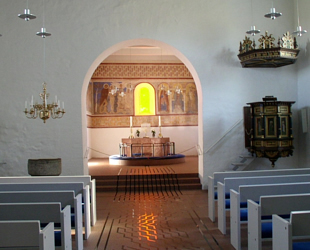 Since the Danes were made Christian in 964 A.C. by King Harald Bluetooth - and later when the Protestant Reformation of the Danish Church took place in 1536 - the Danish National Church was establish with an Evangelical Lutheran culture and its core values - which have affected the Danes Christian mindset - upbringing and native identity ever since. 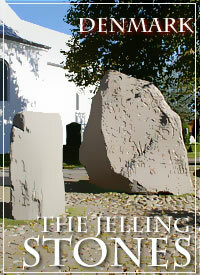 The Jelling Museum is located just across of the Jelling Stones - Jelling Church and the two Burial Mounds. 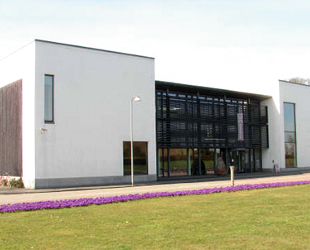 The museum will tell the story of Jelling in the 10th century with displays and historical artefacts - and at the Jelling Museum visitors can experience the Viking Era in Denmark plus more stories about King Gorm - Queen Thyra Dannebod and King Harald Bluetooth. Both Runic Stones have since 2011 been covered with exhibition frames in bronze and surrounded with armoured glass throughout . To preserve the Runic Stones for the future - and to prevent any type of damages - both Runic Stones have been covered with exhibition frames in bronze and surrounded with armoured glass throughout - which was officially inaugurated on December 2011. The glass frames around both runic stones creates a climate system that keeps the stones at a fixed temperature and humidity and protects them from weathering - as well as corrosion - damages and vandalism. The design features rectangular armoured glass casings strengthened by two solid bronze sides mounted on a supporting steel construction. The unbreakable glass is coated with an anti-reflective material that gives the exhibit a natural shade - and the bronze shine gives off a rusty colour - which highlights the runic stones' dusty and ruddy tones that accentuate the runic stones monumental appeal and magnitude. Thousands of visitors from all over the world visits this historical site with the runic Jelling Stones - plus thousands of Danes - who can trace back their Christian upbringing more the thousands of years ago by visiting this Historical place and tourist attraction. Jelling Town on the eastern part of Jutland has a population of almost 3,500 citizens locate in the Jelling Parish - and situated northwest of Vejle municipality - a Region in Southern Denmark. Jelling Town lies 110 metres over sea level. From Jelling Town there is 60 km to Herning and Silkeborg. And there is 80 km to Aarhus - the second biggest city in Denmark. The Region train from Herning to Vejle runs through Jelling - as well as the InterCity line that all stop at Jelling Station. The Jelling Stones has brought much prosperity to Jelling town - which has been gifted by King Gorm the Old and his son King Harald Bluetooth - who found this spot on the East coast of Jutland to erect their memorial stones - first to commemorate Queen Thyra - and since the big stone praising that King Harald Bluetooth - made all Danes Christian. 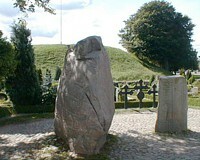 The biggest Jelling Stone is considered to be “The Birth Certificate of Denmark and the Danish Kingdom”. And thousands of visitors from all over the world visits this historical site - plus thousands of Danes - who can trace their Christian upbringing for more than thousands years ago by visiting this Historical place and popular tourist attraction. Jelling is known for its yearly Music Festival with its comfy - trendy and enjoyable atmosphere and image - that draws a significant number of music lovers from all over Denmark - and the always cheerful and happy go lucky audience represents all ages - from all parts of Denmark and Scandinavia. This Jelling site Will be updated frequently!